D810, AF-S NIKKOR 70-200mm f/2.8G ED VR II, 1.3 seconds, f/13, ISO 64, aperture priority exposure, Matrix metering. It was -16 degrees Celsius the morning Dave Van de Laar took this photograph—Celsius because Dave is Canadian. Those of us of the Fahrenheit persuasion would say three degrees above zero. But the designations and even the numbers don't really matter. At eight o'clock on that January morning It was colder than (insert your favorite figure of speech here). Obviously, bitter cold doesn't stop Dave. In fact, he's used to it. "I’m a bird photographer mainly," he says, "and when you sit out there for the snowy owls, you gotta wait in the cold." He took this picture of Horseshoe Falls from a roadway observation point across from the Table Rock Welcome Centre in Niagara Falls, Ontario—it's the building at the top right of the frame. The location is a favorite of his. It's ten minutes from his office, where he works for the City of Niagara Falls, and good weather for photography (and even some not-so-good weather) will often tempt him to stop for some quick shooting before work, or for long sessions on weekends. "It was cloudy that morning, no sun at all," he says, "but it was amazing photographing there during the cold spell. Some days you can't go—when you have an easterly wind, the mist from the falls goes right in your face and you can't photograph." 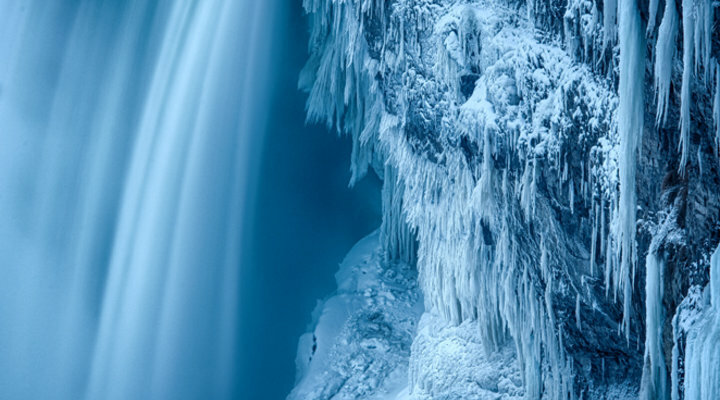 The ice-covered structure in the lower third of the photograph is the Journey Behind the Falls observation building, which is reached by first taking an elevator in the Welcome Centre down 150 feet and then following an access tunnel. Visitors are permitted into the building year round, but in winter the outdoor observation deck is off limits. In case you're wondering—and we were—it's wind-blown mist that creates the free-form ice sculptures descending to the Journey building. Dave generally carries two cameras—the D810 that took this photo and a D3S. The former usually has an AF-S NIKKOR 70-200mm f/2.8G ED VR II on it; the latter an AF-S NIKKOR 18-35mm f/3.5-4.5G ED. "The cameras work fine in the coldest weather," he says. "I just make sure the battery is full before I go out. I keep a spare battery in the camera bag, but I've never had to use it." Keeping his hands warm is a problem rarely solved. His left hand is protected by "a big mitt," and on his right is a flip-top mitten that allows his fingers to work the controls and the shutter release. "But," he says, "nothing really helps when it's that cold." Still, as evidenced by this photo and many others Dave has taken, nothing really stops a dedicated photographer. The specs: D810, AF-S NIKKOR 70-200mm f/2.8G ED VR II, 1.3 seconds, f/13, ISO 64, aperture priority exposure, Matrix metering. There's a pretty impressive collection of Dave Van de Laar's images at davehvandelaar.com. You can also view his images at 500px.